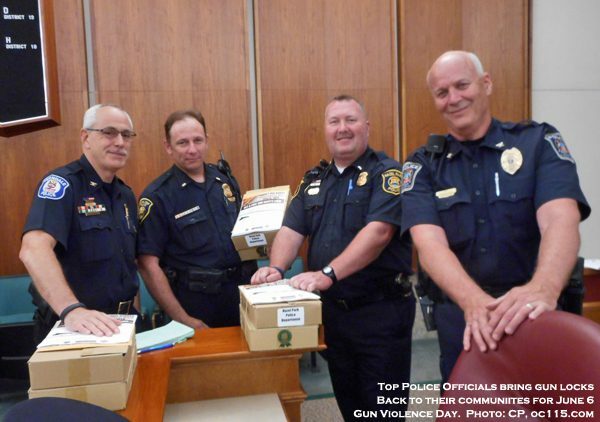 Putting partisan politics aside and collaborating with 38 local agencies, The Oakland County Board of Commissioners organized a fight to reduce gun violence. 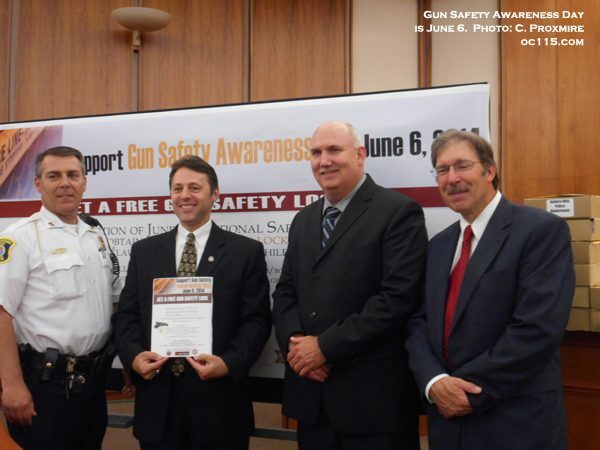 They unanimously voted to make June 6 Gun Safety Awareness Day. They conducted a six month study on the prevalence of gun violence. They created public service announcements to raise awareness of mental health issues, video game rating systems, and gun locks. And on June 3 they gave out 2,000 gun locks to be distributed for free through the 38 agencies involved. ~In 2010, 15,576 children and teenagers were injured by firearms. ~About 85 Americans are shot dead daily. ~53 of those shot dead each day are suicides. ~Every day one of those killed by firearms is a 14 year old or younger. “As a 49 year veteran of law enforcement, I’ve certainly seen my fair share or more of the impact of gun violence,” Dwyer said. “That is why we believe so strongly in gun safety locks. Put simply, gun safety locks save lives. They’re available at no cost and there is no excuse for an unsecured, unsafe weapon in your home. Commissioner Helaine Zack, whose day job involves helping employees cope with stress and personal problems by connecting them with resources or counseling, helped lead the six month study. “We don’t change gun laws or backgrounds checks at this [county] level, but what we wanted was to focus on something that we could change. When responsible gun owners lock up their firearms it helps keep them from being used by criminals or by children,” Zack said. The effort came about after several police officer deaths. In 2008 Oak Park Officer Mason Samborski was killed by a 16 year old with a handgun after a traffic stop. In 2012 West Bloomfield Sergeant Patrick John O’Rourke was shot by a barricade gunman. In 2011 Officer Larry Nehasil was killed in White Lake. The gun locks are available for free and without questions asked through the following departments: Auburn Hills, Berkley, Beverly Hills, Bingham Farms, Bloomfield Hills, Bloomfield Township, Clawson, Farmington, Farmington Hills, Ferndale, Village of Franklin, Hazel Park, Oakland University Police Department, Orchard Lake, Oxford, Pleasant Ridge, Rochester, Royal Oak, Southfield, South Lyon, Sylvan Lake, Troy, Holly, Huron-Clinton Metropolitan Authority, Lake Angelus, Lake Orion, Lathrup Village, Madison Heights, Novi, Northville, Oak Park, West Bloomfield, White Lake and Wixom. They are also available through the Oakland County Sheriff’s Office. Contact the department for specific times the locks are available. To view the report conducted by the Public Service Committee, go to http://www.oakgov.com/boc/Documents/Gun%20Violence%20in%20Oakland%20County15.pdf.